Thin slices of potato layered with butter and baked can be divine, though often I don’t get it right. Various factors affect its success in my experience. First, a creamy-fleshed variety of potato is preferable for a silken soft texture when cooked – floury varieties not so much, risking disintegration and general bogginess. Second, is that a dry, tough top layer of potato can develop due to the length of time needed to cook the potatoes. Third is inadequate cooking; there should be no doubt that your knife can slice through the cooked potato like butter left out of the fridge all day. On Tuesday I struck gold. I had (one of) the right potato types that I sliced to a uniform thinness with a mandolin – which substantially reduces the palava-factor of making this. Slicing potatoes thinly with a knife is time-consuming, difficult and annoying. In a small, buttered ceramic dish I put down a layer of potatoes, seasoned it with salt and pepper, then added thinly-sliced pieces of butter and a few strands of rosemary. I repeated this process until the dish was full. To avoid a dry top, I covered the dish with tin foil – not particularly tightly – and kept it on through the cooking process. The potatoes still browned a little and it wasn’t tough at all. I have a fan oven, which may account for why the potatoes were still partially browned. Finally, to achieve adequate cooked-through-ness, I added a small amount of water, like 1/2 cup, to the dish, twice. I did this once after about 30 minutes of cooking, and then again 20 minutes later. In total it cooked for around an hour in a pre-heated, hot oven. Composing a dish often feels like a writing or editing process. Before I landed on potatoes, I was going to make baked chicory wrapped in bacon covered in white sauce – but recalled that we’d had a dish with white sauce two days before. Furthermore, I prefer to wrap chicory in ham and am not keen on un-rendered bacon wrapped round wet things. However, there was a chill in the air and so something baked was needed. I decided instead to cook the potatoes as above. 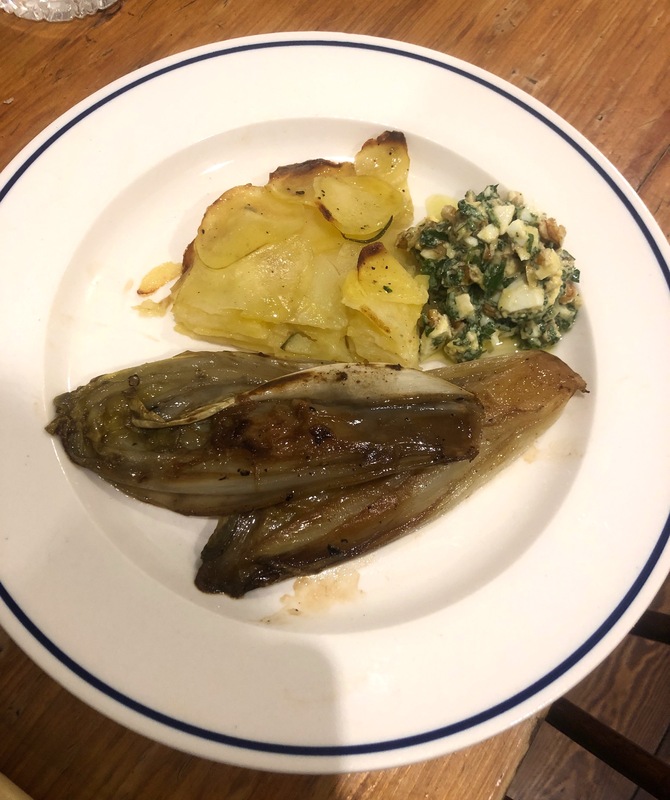 However, the potatoes alone were not enough and I didn’t want to use the chicory to make a salad, which would jar against the potatoes, especially as no richer/meaty/cheesy element was available to have with it. But if we just had fried chicory, it would not be enough and would taste too one-note. While chicory adds a good bitter note even when fried for ages in butter, there would be no non-buttery things on the plate! And no protein. Finally, as so often, the solution is eggs. Chopped hard-boiled eggs (one each), mixed them into a thick, rough sauce with olive oil, a very tiny piece of crushed garlic, chopped walnuts for a little texture and depth, parsley, and lemon zest and juice for aciditiy to set the buttery potato into gorgeous relief.